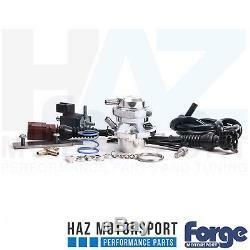 Forge Recirculating Dump Valve Kit Golf Mk7 GTI/R Audi S1/S3 8V TTS Mk3 Polished. Forge Motorsport is proud to release the latest version of our very popular solenoid driven valve for the 2013-on VAG 1.8 TSI engine (US codes CPKA and CPRA) and 2.0 TSI engine (Euro code CNTA, CHHA, CHHB, CJXB and CJXC;US codes CPLA and CPPA) including Golf MK7 R. This valve is fully engineered to remedy the failure issues experienced with the OEM solenoid valves when their diaphragm may rupture which results in a boost leak. The later revision OEM valves have a longer lift but ultimately the plastic brittles and in extreme circumstances, parts of the plastic can break off. Our valve uses full billet alloy construction with a piston based internal design that provides for significantly improved reliability over the OEM valves along with lightning fast response. It has also been proven in cars running over 600bhp! This new valve has a very short overall installed height, which enables fitment of this atmospheric valve into the tight space between the turbo and the inlet hose from the airfilter, older larger valves and sandwich plates will not fit this engine. 1 x Solenoid, Bracket, and Screws. 1 x Uprated Blue Spring. 1 x 1000mm of 4mm Vacuum Tube. 1 x 5mm T Piece. 1 x Forge Keyring and Sticker. PLEASE NOTE THIS LISTING IS FOR THE POLISHED SILVER RECIRCULATING DUMP VALVE KIT. 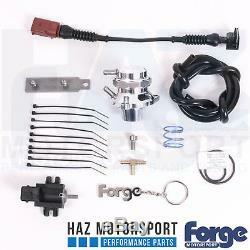 The item "Forge Recirculating Dump Valve Kit Golf Mk7 GTI/R Audi S1/S3 8V TTS Mk3 Polished" is in sale since Friday, September 15, 2017. This item is in the category "Vehicle Parts & Accessories\Car Tuning & Styling\Air Intake & Induction\Dump, Bypass & Blow-Off Valves". The seller is "haz_motorsport" and is located in Dewsbury. This item can be shipped to United Kingdom, Austria, Belgium, Bulgaria, Croatia, Cyprus, Czech republic, Denmark, Estonia, Finland, France, Germany, Greece, Hungary, Ireland, Italy, Latvia, Lithuania, Luxembourg, Malta, Netherlands, Poland, Portugal, Romania, Slovakia, Slovenia, Spain, Sweden, Australia, United States, Canada, Brazil, Japan, New Zealand, Israel, Hong Kong, Norway, Indonesia, Malaysia, Mexico, Singapore, South Korea, Switzerland, Taiwan, Thailand, Saudi arabia, South africa, United arab emirates, Ukraine, Chile.